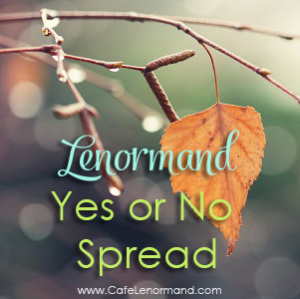 Whether you are trying to decide if you should do something or you're simply curious about how events will turn out, the Lenormand Yes or No spread can give you an answer quickly. I love the Yes or No spread and use it all the time. 1. Get very clear on the question you want to ask the cards. 2. Shuffle while focusing on your question, your current situation, and the possible outcomes (i.e., what happens if it's a yes and what happens if it's a no). 3. Draw 5 cards and place them face-up in front of you. 4. Count how many positive and negative cards there are before you read the spread. (Note: When you read the spread, you'll read it like a Lenormand 5 card spread). If you have more positive cards than negative cards, the answer is yes. Read the cards for more insight into how things will play out. If you have more negative cards than positive cards, the answer is no. Read the cards for more insight into how things will play out. If you have the same number of positive and negative cards, or all the cards are neutral, read the cards for your answer. With one positive card and no negative cards, the answer to the question is “yes”. Reading the cards now for more insight, we see that the central card is the House. The House is a card that represents the place where you live. Since my question involved moving to Scotland, it's a nice card to see. It shows that the cards are answering the question and pointing to establishing a home. It also indicates that Scotland is a place I'd feel quite comfortable and stable living. Looking at the Garden, I'm going to step outside of the box a bit with the meaning of this card. In this spread, the Garden can certainly represent the traditional meaning of meeting new people, and I do think it does (more on this later). But the Garden can also represent nature which leads me to interpret this card as representing the Scottish countryside. Some might argue that since Scotland is famous for its Highlands, the Mountain would better represent Scotland but since this is a yes no spread, the answer the cards are giving would completely change because the Mountain is a negative card. Thus, another reason why I believe the Garden represents Scotland. Looking at the Heart, we not only have the card that indicates “Yes, I will move to Scotland soon”, but we also see that it's something I would love to do. The Crossroad shows that I haven't fully decided whether to stay or go. It's still a choice for me to make. As for the Man, well, there's not much to say about him except that he's involved in my moving. Garden + Heart indicates that I would love to move to Scotland. It's a place I enjoy and feel quite connected to. It would be a good match for me. Heart + Home reminds me of the phrase, “Home is where the heart is.” Again the cards show that not only is it a place I would love to move to, but it would be a good place for me to live. Home + Crossroad indicates a decision I still have to make. It can also represent two houses. I know that even if I were to move to Scotland, where I am now would still be home to me whether or not I had a physical residence here. My family is here. Crossroad + Man shows that the decision involves, maybe even hinges on, a man. Garden + Man – here we get to the other meaning of the Garden I was referring to above – meeting someone. The cards are referring to my meeting a man who plays a pivotal role in my moving to Scotland. I don't know who he is, and the cards confirm this by where the Man falls in the spread. Heart + Crossroad represents how I haven't committed to staying or going. My heart is inclined to go down a path, but nothing is set in stone yet. What Happens after the Lenormand Yes or No Spread? It's quite likely that you'll still have questions after you do a yes no spread. While you've gained insight into the question asked, you might have more questions than when you started. Based on the example I provided above, I could easily ask for more information about the man, whether I meet him before or after the move, or even how he plays a role in my decision. Lenormand cards are there to help you gain answers. They love to gossip and fill in all the details. Whether you choose to do another Lenormand Yes or No spread, or another spread entirely, have fun! When you ask additional questions, do you leave the first cards down (out of the deck) and just draw more cards from the top of the deck? Or do you reshuffle while thinking about your question and draw the additional cards (still with the first ones down on the table)? Or do you add the first cards back in and reshuffle before drawing cards for the additional question so your drawing from a full deck? Hi Jacqueline = Great questions! Option 3 – Add the cards back in so that you’re shuffling and drawing from the full deck.